Plants vs. Zombies Heroes brings the epic battle between cute plants and the stinky undead to your mobile device, but this time you will be playing a crazy collectible card game that’s as addicting as the original game. You will be building your own deck, developing a strategy and collecting your favorite PvZ characters. The game introduces several new “Heroes” and more than 200 collectible cards. You can choose your plant or zombie hero and fight enemies in PvP and campaign battles. Whether you are playing plants or zombies, the “zombie trick” phase, which appears just before “Fight” might leave you a bit confused. And if you are playing plants, then you might feel a bit defeated thinking that zombies are getting another chance. But that’s not the case. Plants too can use tricks, but they don’t have a separate phase. When your turn comes, you can deploy a playable trick card from your hand, a normal card or both normal and trick card if you have enough suns to play both. If you are playing zombie, then you cannot use tricks cards when your turn comes. 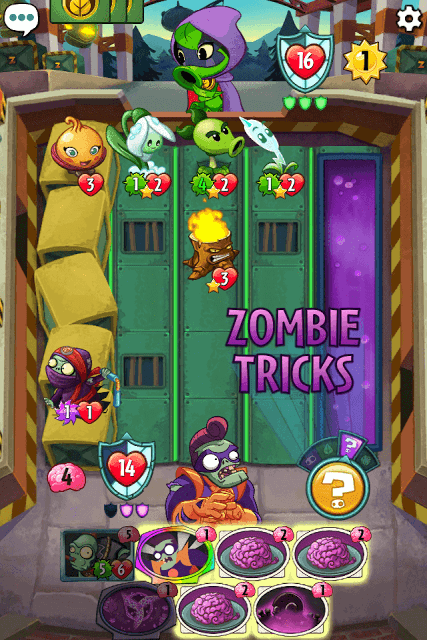 You can only play a normal card and if you have some brains left, use it to deploy a trick card in the “Zombie Tricks” phase. So it’s your turn and you are planning to teach your opponent a lesson. You are so furious at the way he reduced your hero’s HP that you blindly deployed a card thinking it will be the best one. But wait. Have you checked other playable cards? Maybe there are cards that have added benefits when played. Maybe there’s a trick card, or a buff card or a card whose stats increase automatically once played on heights or when a zombie gets frozen. You just have to tap on each playable card when your turn arrives to check what bonus benefits they have to offer besides attacking opponent cards. It totally depends on the situation you are in, the resources (sun/brains) you currently have and the cards deployed by your opponent. And so it is crucial to check each playable card before deploying it in the lanes. You can take advantage of special lanes such as water, heights etc. by playing those cards that do extra damage or receive stats boost when placed on such lanes. Plant cards like the Cabbage-Pult gets +1 ATK and +1 HP when placed on heights. Make sure you include such cards in your deck before starting a battle. An amphibious card can be very useful in battle because no other cards, except amphibious cards, can be placed on a water lane. This makes your opponent’s hero extremely vulnerable to your card’s attack as he cannot place any card opposite your amphibious card. In case the game has drawn an amphibious card for you and you have the required resources to play it, don’t hesitate; just place it on the water lane. It will attack your opponent’s hero, reducing his HP in every turn until and unless your opponent deploys a trick card that changes your amphibious card’s position or places his amphibious card opposite yours on the same water lane. Players who are playing zombies should also beware of strikethrough and splash fighters as they can harm amphibious cards. 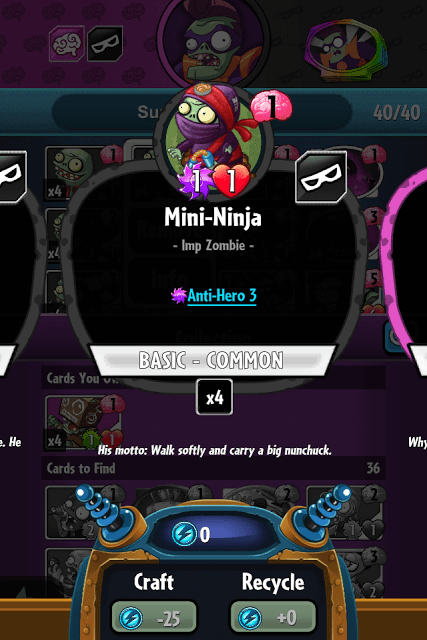 Whether you are playing zombie or plant, don’t ignore or underestimate your anti-hero card’s power. When placed on an empty lane, its damage increases and it does more damage to your opponent’s hero. You will be in a total win-win situation if the anti-hero card is also amphibious. The Walrus Rider card (under Super Brainz hero) is one example of an anti-hero, amphibious card. Another extremely useful anti-hero card is the Stealthy Imp. It’s a gravestone plus anti-hero card. Gravestone, a zombie-only ability, hides a zombie in it until the “Zombie Tricks” stage. You can deploy this card if you are going first. Your opponent won’t be able to know what card it is. You are indeed lucky if you have these two cards in your deck. Use them wisely. Don’t deploy an anti-hero card if it’s your turn first. Save it for such situations where your opponent has finished his turn and there’s still an empty lane. If it’s your turn first, and then your opponent’s turn, and if you have played an anti-hero card, then chances are that he will deploy a card opposite your anti-hero card, neutralizing his attack boost, as an anti-hero card’s damage increases only in empty lanes. 1. Strikethrough: A plant or a zombie with strikethrough ability hits multiple enemies, including your opponent’s hero. 2. Armored: As the name suggests, armored zombies or plants are pretty stronger than normal fighters and receive reduced damage. 3. Amphibious: These cards can be played in water lanes. 4. 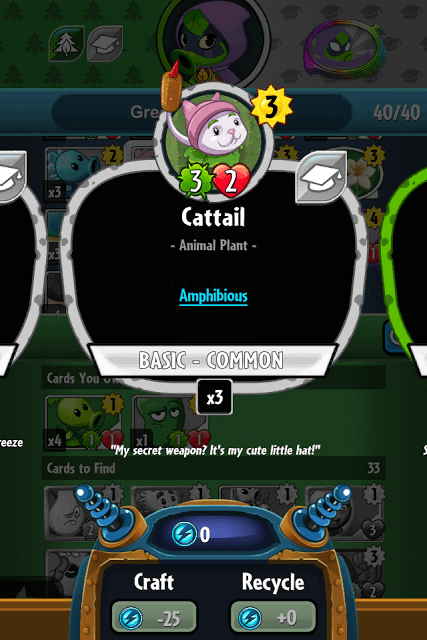 Team-Up: One of the best plant abilities, a card with this ability can be placed behind a team-mate or in the front of a team-mate. You can also place a team-mate in front of or behind a card that has the team-up ability. 5. Freeze: Can be used to freeze an enemy. The frozen plant/zombie won’t attack when his/her turn comes. Splash: a Plant-exclusive ability, splash can deal damage to zombies placed next to the target zombie. 6. Deadly: After the battle is over, A Deadly zombie eliminates those plants that have been injured by him. Sneaky class zombies have this ability. 7. Frenzy: Zombie-exclusive ability. A zombie that has this ability attacks again after it destroys a plant. 8. Bullseye: A plant or a zombie with bullseye ability can be used to neutralize enemy hero’s super-block meter. The ability will be triggered when a plant or a zombie hits enemy hero. Smarty class fighters can be quite effective against enemies that have Bounce and Freeze abilities. They can also be effective against amphibious enemies and possess abilities like Splash. Solar Class fighters can make extra sun, can heal fellow plants and have the strikethrough ability. Kabloom class fighters can do extra damage to enemies. Some Kabloom class fighters provide stats boost and other effects to fellow plants. Guardian Class fighters are armored, amphibious plants. You will also find several team-up plants under this class. Brainy class fighters can be quite tricky. Some fighters can help you gain extra brains. You will find zombies with bullseye ability under brainy class. Sneaky class fighters can move from one lane to another, hide under gravestones and can be amphibious. Hearty class fighters can have high health. You will find some great healer and armored cards under this class. Beastly class fighters can become huge and use frenzy ability. Crazy class fighters have the moves to die for. They are deadly dancers and deal damage directly. A premium pack contains at least 1 rare, super rare, legendary or a new hero. To get a premium pack, you will need gems, which can be either purchased with real money or can be earned for free by completing certain Quests and Hero Quests. On your home screen, tap the exclamation mark to see what quests are available. If you have just started playing, you will get plenty of gems after completing hero quests and normal quests. Playing both zombie and plants in campaign mode will get more gems from each campaign. You can also earn gems from PvP battles. Tap the yellow “Battle” button to check for rewards under each PvP fight screen. If there are no gem-related quests, then you can try to purchase a basic pack. A basic pack can be easily acquired with coins. You can earn them after each PvP or campaign battle. Don’t turn a blind eye to basic packs, because they usually contain those cards that require fewer suns/brains, and by now you know that protecting your hero is crucial to win a battle. When the game starts, you will have fewer resources and such cards will be of immense help to protect your hero in the first stages of play. Having a mix of rare, common and uncommon cards in your deck will help you manage your fighters well. You get a random Superpower when the game begins. You will get to play more superpowers when you superblock, which is activated when the Superblock Meter charges up fully. The meter is shaped like a shield, and can be seen just behind your health (heart-shape). It fills up every time your hero gets hurt. It fills 1, 2 up to 3 sections randomly and once charged, triggers superblock. This is when you get a random superpower. I recommend using a superpower instantly when you receive it. You can deal some serious damage to the opponent’s cards and if you are lucky, then you might get a superpower that attacks only the opponent’s hero. Saving a superpower for future won’t be a good idea, as it will cost resources. And you don’t want to use resources for something that was available for free when superblocked. So better swipe a superblock up when you get it.